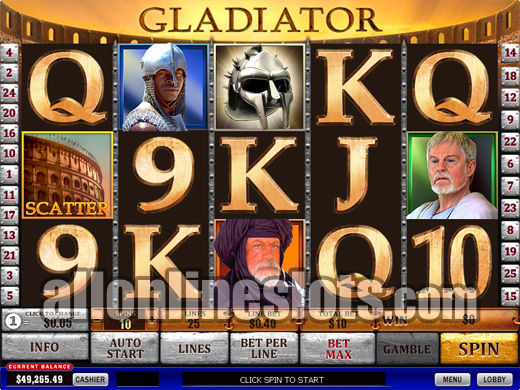 Gladiator from Playtech was our pick for Slot Machine of the Year in 2009. It is an impressive game with great graphics, video scenes and two bonus features. 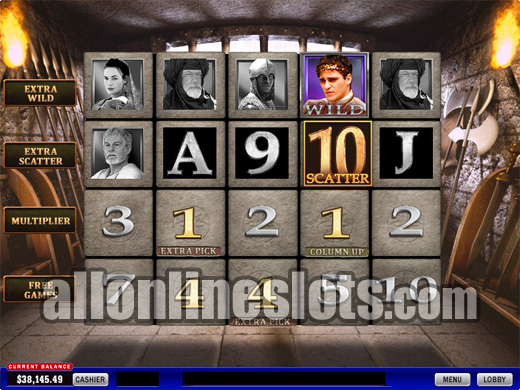 Win free spins with extra wilds and scatters or the reel based Gladiator Bonus. Gladiator was a huge box office hit in 2000 which went on to win 5 Oscars. Now Playtech have released an officially licensed slot based on the film. The game uses the popular 5 reel, 25 line format and has two bonus features. What really makes the game stand out is the fact that you have actual video from the film for both the bonuses and on the reels. Oddly the main character, Maximus played by Russell Crowe in the film does not appear anywhere in the game. This might be due to his anti gambling stance or the fact that he may have wanted too much money to use his image. On the reels you do have Commodus (Joaquin Phoenix), Lucilla (Connie Nielsen), Gracchus (Derek Jacobi), Juba (Djimon Hounsou) and Marcus Aurelius (Richard Harris). Not only are these symbols images but when you get a win with the images they turn into video - very impressive. The game has a maximum bet of 250 coins per spin or 10 coins per line. Coin sizes start at 1c so the lowest max bet comes in at $2.50 per game. You can play less than max coins and you will not miss out on any features. Of course the bigger you bet the bigger the possible wins. The wild symbol on Gladiator is the Helmet. The wilds only appear on the middle three reels so you cannot get five wilds during normal play. The Helmets do however activate the Gladiator Bonus when you get all three anywhere on the screen. 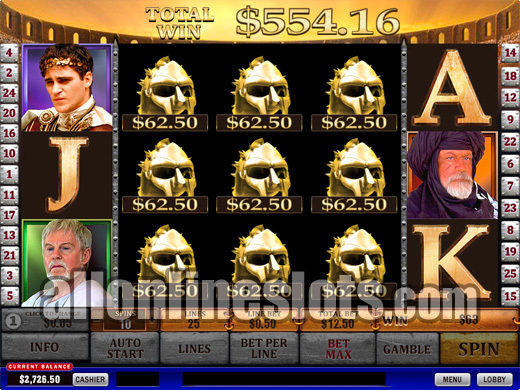 Top line win on Gladiator is 5,000 coins for five Commodus symbols. This pays up to 50,000 coins if you are playing 10 coins per line. Second highest line win is 1,000 coins (10,000 at max bet) for five of the Lucilla symbols. From there the five of a kind line wins range from 350 to 75 coins. Of course there are lots of other wins for three and four of a kind pays. The Coliseum symbols are scatters and activate the free spins bonus. Get three or more and you win a shot at the bonus stage. Get five of the Coliseum scatters on the screen at the same time and you win a nice 100 times your bet or 25,000 coins if you are hitting the max bet button. Once you have activated the bonus you are treated to a quick video sequence where you are heading through some tunnels. You end up in a room with a grid four rows high and five rows wide. This is where you will get your amount of free spins and any extra wilds or scatters. You start at the bottom of the grid and pick on square at a time. After each pick you either get another pick, move up a level or collect your wins and move back to the reels. On the first row each pick awards free spins. The second row awards multipliers. The third row adds extra scatters and the last row adds extra wild symbols. More often than not you will only get to the multiplier row when you hit a collect square but the wins can really be huge if you get the extra scatter and extra wild. You can get lucky and reveal a Level Up logo which collects all wins in that row right up to the top. Once the bonus stage is complete you move back to the reels for your free games.. 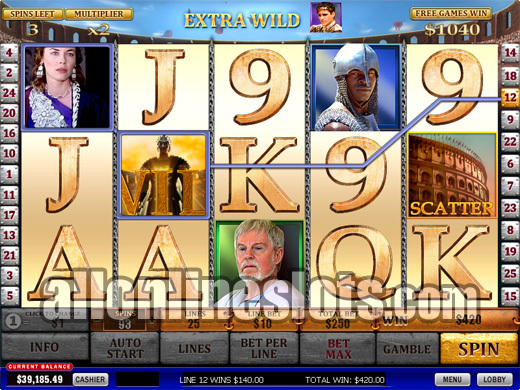 The free spins cannot be re-triggered but any Commodus symbols appearing on the middle reel add three more free games. If you won an extra wild you will now have wilds appearing on all reels. If you get five wilds you win the top pay of 5,000 coins as there is no specific five wilds pay. The extra scatter feature was first seen on Captains Treasure Pro and can result in some huge wins. The selected symbols becomes scattered during the free games and any scatter wins pay times your total bet. Each symbol has a different pay table but we have seen up to 2000X or a huge 500,000 coins! 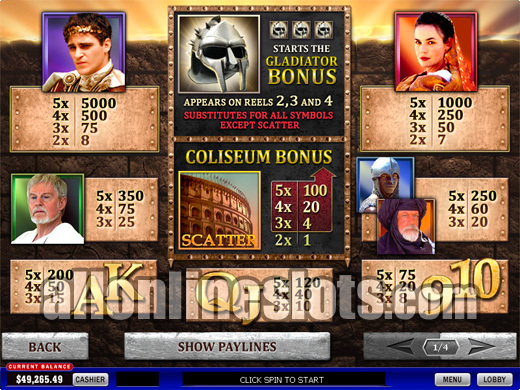 If the free spins bonus is not enough you also have the Gladiator Bonus. Get three wild Helmet symbols on the screen at the same time and you win a shot at the bonus. The middle three reels are replaced with either bronze, silver or gold Helmets. These pay X1, X3 and X5 respectively and you get nine Helmets per bonus which means you are guaranteed at least 9X your bet. Overall, the Gladiator slot machine from Playtech is one of the best online slots we have seen and unless something even more impressive comes out in the next few months this game is odds on favorite to win game of the year for 2009.